Black python with signature woven leather. Gun metal hardware. 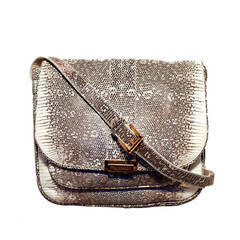 Python leather crossbody strap. Taupe suede interior. One interior zippered pocket. One interior phone pocket. Bottega Veneta intrecciato woven crossbody fuchsia handbag. Excellent condition. Comes with matching leather mirror and dust cover.